UNITED NATIONS (United States) (AFP) – A record-equalling 188 countries on Tuesday condemned the five-decade-old US embargo against communist Cuba in an annual UN General Assembly vote that signalled hardening opposition to US sanctions. Only Israel joined the United States in opposing resolution, the smallest number ever. Last year two allies voted with the US government. Three Pacific island states normally close to the United States — Micronesia, Marshall Islands and Palau — abstained as the barrage of criticism of the embargo reached a new peak in the 22nd annual vote at the UN Assembly. China, Iran, which has launched a bid to thaw relations with the US administration, Latin American and African nations all publicly condemned the United States. “The US policy against Cuba is suffering from an absolute international isolation and discredit and lacks every ethical or legal ground,” Cuba’s Foreign Minister Bruno Rodriguez Parrilla said. Cuba has lost more than $1.1 trillion dollars because of the embargo, according to the minister who told the meeting how the blockade prevents Cuba from getting heart and anti-AIDS drugs for children. The United States is being used as an “external scapegoat” for the island’s problems, a US diplomat, Ronald Godard, hit back in an address to the meeting. “Our sanctions policy toward Cuba is just one of the tools in our overall effort to urge respect for the civil and human rights” upheld by the UN, Godard said. He said that two billion dollars in remittances were sent to Cuba from the United States in 2012 and that the United States is the biggest foreign food supplier to the island. “The international community cannot in good conscience ignore the ease and frequency with which the Cuban regime silences critics, disrupts peaceful assembly (and), impedes independent journalism,” Godard said in an appeal to other countries to oppose the resolution. The United States started imposing measures after Fidel Castro seized power in 1959 and nationalized US-owned properties. An official embargo was imposed in 1962. Envoys from around the world slammed US policy. Iran called off a diplomatic ceasefire with the United States to condemn the embargo as a “despicable practice.” The blockade “flouts international law,” said Iran’s deputy UN ambassador Hossein Dehghani. “The call of the international community is getting louder and louder, demanding that the US government change its policy toward Cuba,” China’s deputy UN ambassador Wang Min told the debate. 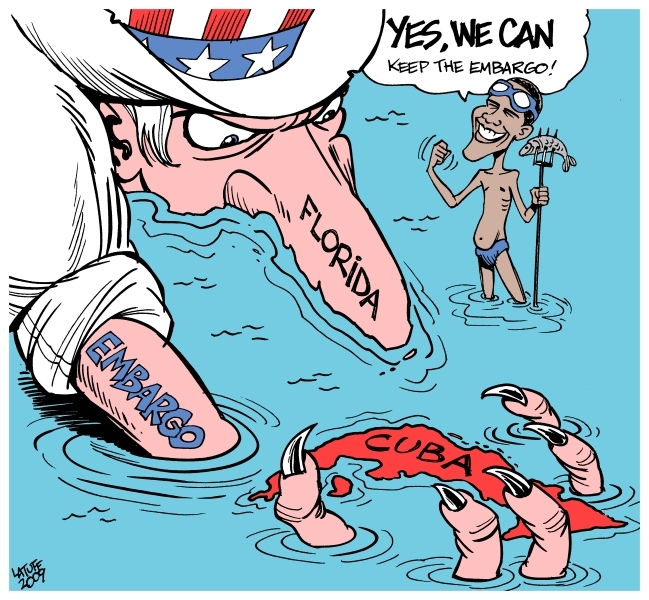 European nations now oppose the embargo because US legislation even punishes foreign firms that trade with Cuba. The United States last year eased restrictions on visas for Cubans. The Cuban government has also made travel easier for its nationals. Cubans have made more than 180,000 trips abroad this year, according to official figures. The US interests section in Havana granted 16,767 visas to Cubans in the first half of 2013, up nearly 80% over the same period in 2012. Esteban Morales, a Cuban intellectual and specialist on relations with the United States believes the increased travel could be a chink in the armor that could help “end” the embargo. But other experts say the measures are too timid. Mavis Anderson of the Latin America Working Group, a non government groups, said that the US administration would have to take a stronger step such as taking Cuba off its list of countries supporting terrorism if it wants better relations. “The international community believes that Cuba should not be there ,” said Anderson.